Late-Night TV host transforms into "Joking Bad"
He even teased the spoof on Twitter with a selfie and a promo shot of the "show." Jimmy Fallon's "Late Night" will return from its summer hiatus with a vengeance in September, promising a spoof of AMC's "Breaking Bad" with Fallon himself as the show's iconic character. In a preview of the upcoming season shared with "Today," Fallon shows his transformation from witty funny guy to BB's Walter White. 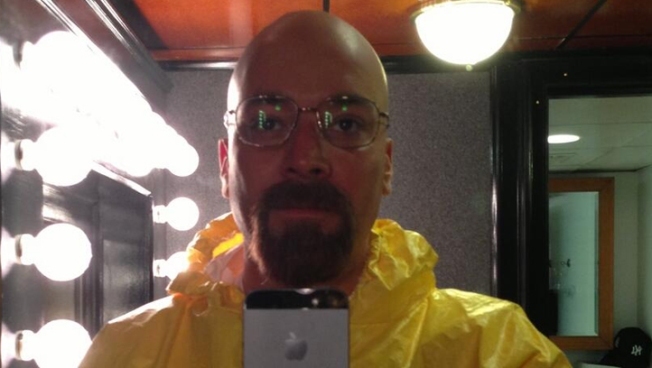 He even teased the spoof earlier this week on Twitter with a selfie and a promo shot of the "show," dressed in White's trademark yellow meth-cooking suit. Fallon isn't a stranger to TV parodies on "Late Night." During his time on the show, Fallon has spoofed "Game of Thrones" and "Downton Abbey" with aptly named parodies "Game of Desks" and "Downton Sixbey."